Do you ever get bored of your city’s culinary offerings? What if they switched out on a regular basis, providing a never-ending carousel of dining experiences? In many urban areas, food trucks have taken international cuisine on the go, but they aren’t the only game in town when it comes to temporary dining establishments. They appear in pop-up form, in transportable shipping container structures, or just temporarily taking over a space. 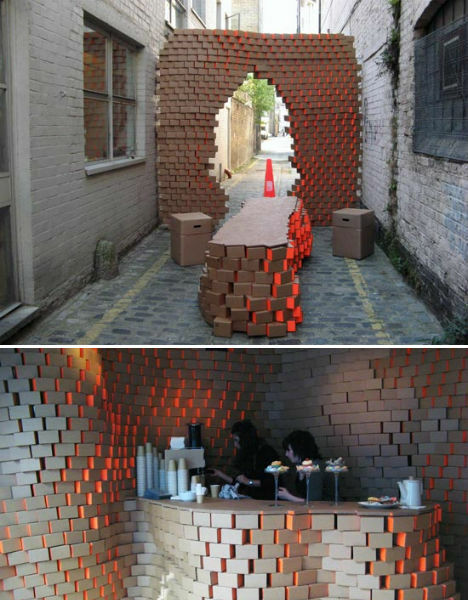 British interior architectural consultants B3 Designers stacked and hot-glued hundreds of cardboard boxes to create a temporary cafe in an alley beside their office during the London Design Festival. The boxes were slightly staggered and painted orange on either end to mimic the look of bricks. For opening night, the designers encouraged their guests to wear cardboard clothing as they enjoyed cocktails in cardboard cups. Tucked in a corner of the Old Port in Montreal is Müvbox, a portable restaurant powered with solar panels that unfolds from a sleek rectangular volume into a beautiful modern cafe with outdoor tables and a canopy. 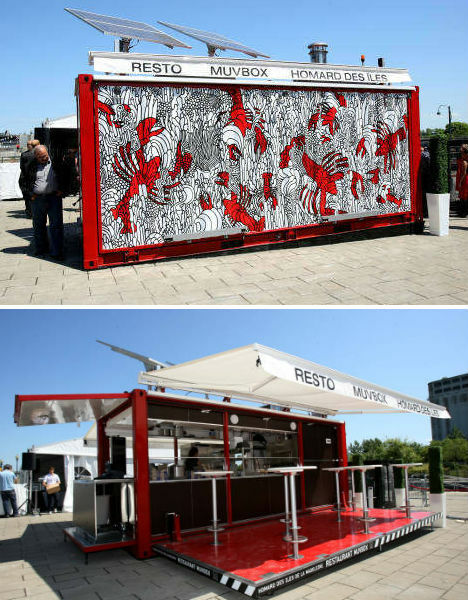 Owner Daniel Noiseux of Montreal’s Pizzalolle restaurants fitted a kitchen and seating for 28 guests into a standard 28-foot shipping container with a floor made from recycled tires. It serves fresh, local and gourmet foods including local specialties like Madeleine lobster and Brome Lake duck. 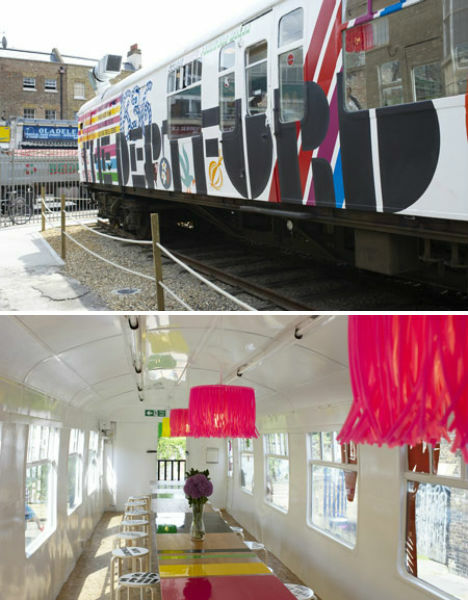 A 1960s commuter train carriage serves as an adorable, brightly-colored restaurant by graphic designer Morag Myerscough. The Deptford Project Cafe is part of an ongoing effort to revitalize the railway yard of the Deptford area in south east London. Its bathroom is a garden shed made to look like a shrine to Elvis Presley. 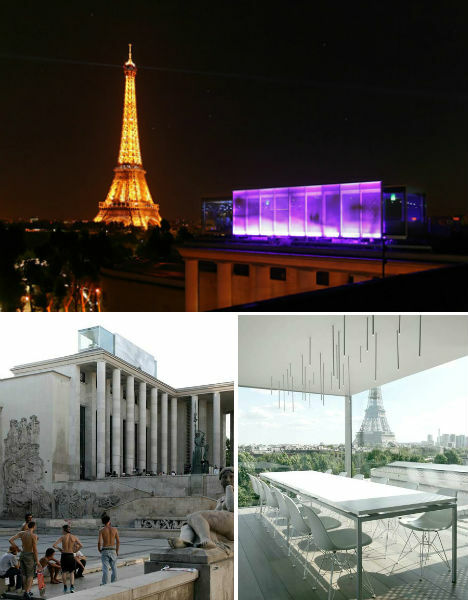 Le Palais de Tokyo museum in Paris temporarily played host to a transportable pod restaurant called Nomiya in 2009. The work of Parisian architect Pascal Grasso, Nomiya featured a dining room for twelve with panoramic views of the Seine and the Eiffel Tower. At night, it was illuminated like a lantern, with purple lights shining through its glass cabin and perforated metal screen. 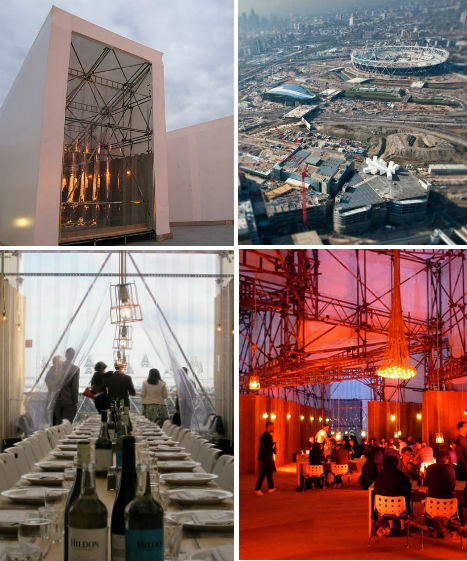 London architects Carmody Groarke designed Studio East, a temporary restaurant built on a construction site overlooking the Olympic Park in London and constructed using materials borrowed from the building site like scaffolding and timber. 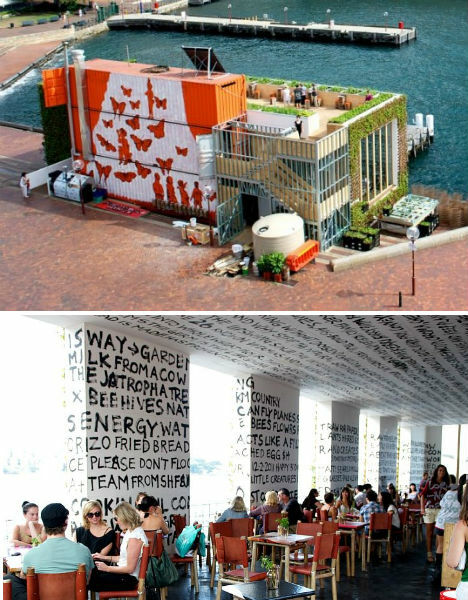 Covered in walls made of plastic sheeting, the restaurant was opened between June 16th and July 4th of 2011 and hosted communal feasts prepared by the head chef of Bistroteque, Tom Collins. 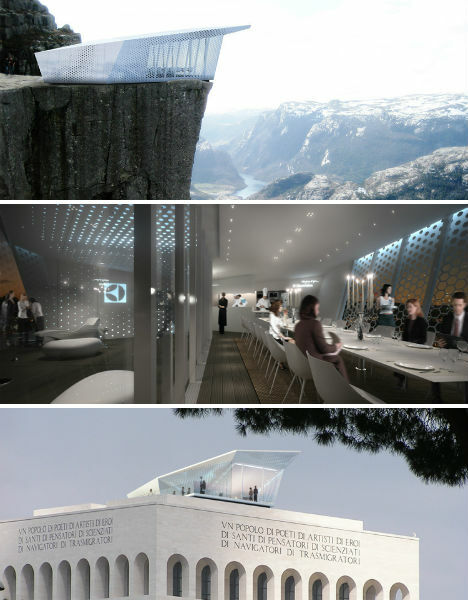 Two pop-up restaurants by Swedish appliance brand Electrolux traveled across the world to perch atop famous buildings, monuments and cliffs including the arc of the Parc du Cinguantenaire in Brussels. The kitchens were equipped with Electrolux appliances, of course, and the name of the company was be emblazoned on the cubes’ exteriosr. 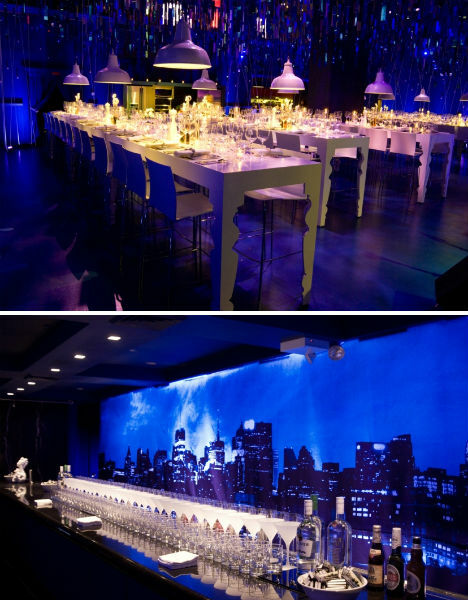 The cubes themselves, designed by Italian architects Park Associati, featured a laser-cut aluminum skin and room for 18 to dine. For one week only in 2007 and again in 2008, Bon Appetit Magazine hosted a ‘Supper Club and Cafe’ in midtown Manhattan at 57th Street and Broadway. 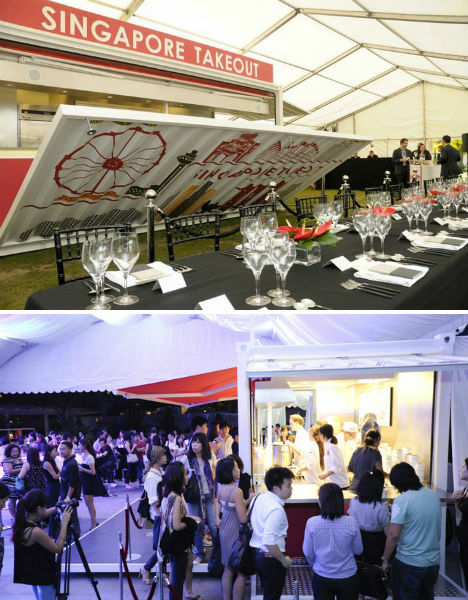 The temporary restaurant featured public demonstrations and book signings with big-name chefs like Mario Batali, Cat Cora and Giada de Laurentiis. The look in 2007, designed by Rockwell Group, featured hundreds of dangling mirror slivers reflecting the blue and purple LED lights. 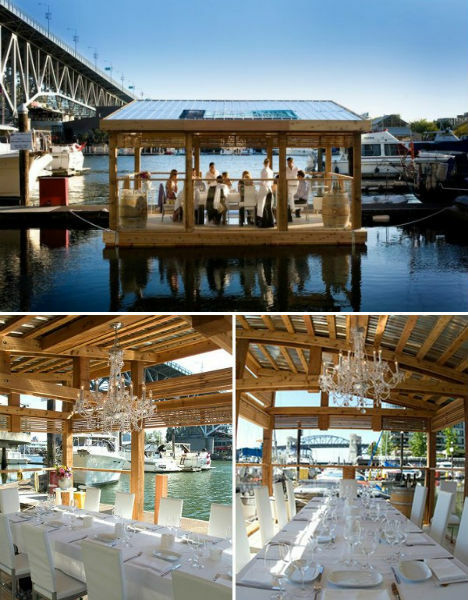 A raft made of 1,672 2-liter plastic bottles plays host to a lovely floating restaurant in Vancouver. The Plastic Dining Room is sponsored by the School of Fish Foundation and catered by C Restaurant, moored at the False Creek Yacht Club. Guests seated inside the dining room not only enjoyed fine meals and views of the water, but also reclaimed pinewood interiors and recycled glass chandeliers. Imagine taking your supper in the grand foyer of a Masonic lodge that’s normally closed to the public. 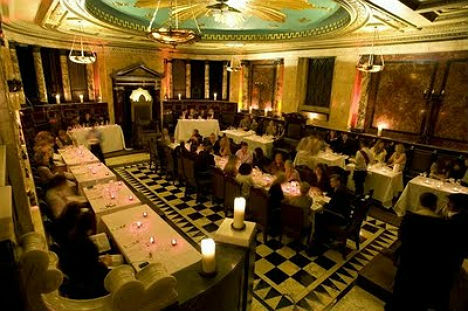 That’s what guests of the temporary Supersonic Masonique were able to do when this restaurant popped up at ANdaZ Hotel’s Grade I Listed Masonic Temple in London in 2009. Also headed up by the chefs at Bistroteque, Supersonic Masonique was a 50-seater, 3-night dining experience featuring such dishes as Kentucky Fried Quail, sushi & frozen cognac and pink champagne candy floss. Shipping containers, straw bales, a rooftop garden, solar panels and even on-site water harvesting and recycling make Joost’s Greenhouse one of the most eco-friendly restaurants around. In fact, Joost Bakker’s traveling pop-up restaurant is entirely waste-free and produces some of its own herbs and vegetables. Used cooking oil powers the restaurant’s generator and all organic matter is composted for the restaurant’s garden. The menu changes according to what’s locally available at the restaurant’s latest location. 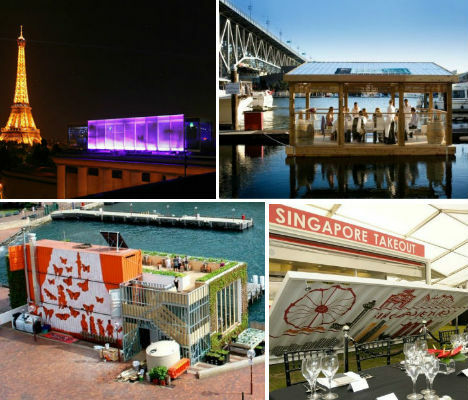 Built in a shipping container, the custom-designed Singapore Takeout pop-up restaurant travels around the world to give patrons a taste of Singapore’s food and culture. The front of the shipping container folds down into a walk-up ramp where visitors can order Singaporean noodles, dumplings and other dishes. 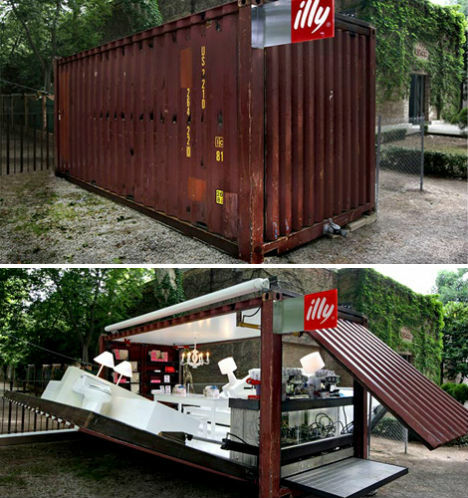 Espresso producer Illy teamed up with architect Adam Kalkin to turn the latter’s Quik House – a shipping container that folds into a home – into a mobile cafe. The Illy Cafe looks like an entirely unremarkable, rusting, beaten-up shipping container when it’s closed up. But amazingly, at the push of a button, the sides of the container fold down to reveal benches, a table, shelves and an espresso bar. 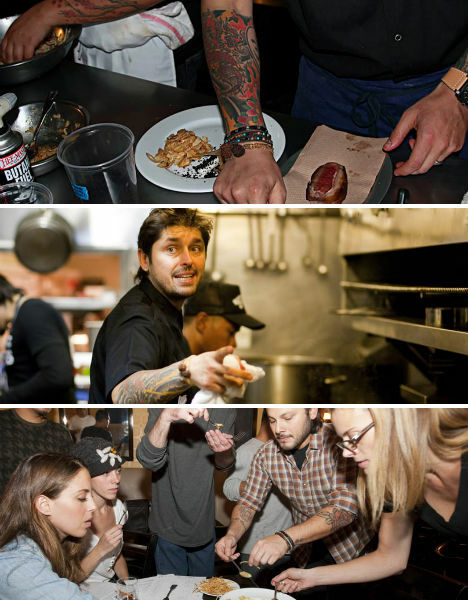 Chef Ludo Lefebvre brings his cuisine to locations around the nation as part of his Sundance Channel show, ‘Ludo Bites America’. Each incarnation of LudoBites has overtaken an unused space, initially in the Los Angeles area, in guerrilla fashion (though not, of course, without the permission of the property owners.) Though perhaps more known for his buffalo hunting and eating thanks to the reality show, Lefebvre’s cuisine draws massive sell-out crowds to each temporary installment of the restaurant. 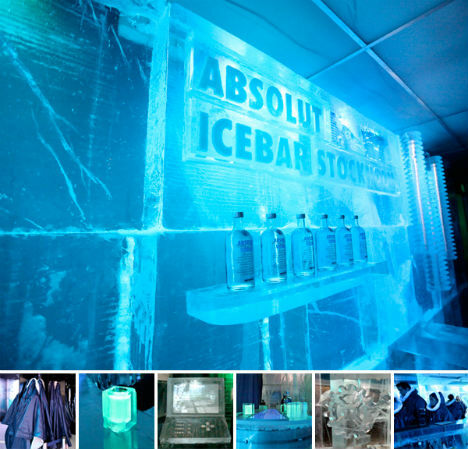 Absolut’s Icebar is a pop-up concept, showing up each holiday season in London. Inspired and sponsored by the Jukkasjarvi Ice Hotel in Sweden, the bar is brought back year after year, and proved so popular that London soon got its own permanent ice bar at ‘Below Zero‘, a restaurant and lounge made of ice. Installed for London’s Design Week in 2010, Hel Yes! 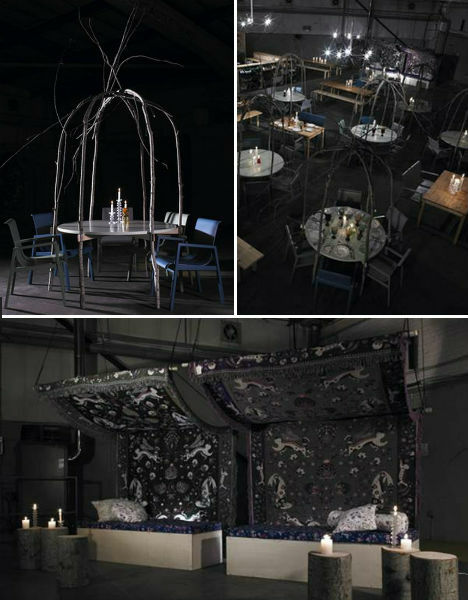 was a showcase of Finnish cuisine temporarily erected in a warehouse space. In addition to sampling Finnish delicacies, guests enjoyed the interior decor, which was designed by some of Finland’s top talent in areas like furniture and luxury textiles.